How many times have you craved a fresh cannoli but - no such luck? They’re difficult to find unless you live in Italy or near an Italian bakery. I recently had a request from some friends to take them back to an old memory of wandering the streets of Italy in search of the perfect cannoli. So we decided to have a cannoli party. Since I always shy away from fried foods, I chose to pursue my quest for cannoli using a baked shell rather than the traditional fried one. I also decided to simplify the process by leaving the shell as a thin flat cookie or tuile. Just to make it easy, the plating is more like a Napoleon. But I’m afraid I may have to think about calling it something else since the translation for cannoli is “little tube.” Please forgive me, my dear Italian friends! I think you’ll find that this new wave rendition is every bit as delicious, if not more so. The amazing flavors of a thin crispy-crunchy-chewy caramelized orange cookie contrasted with the slightly sweet creamy delicacy of ricotta and punctuated with a little burst of chocolate make this dessert irresistible. 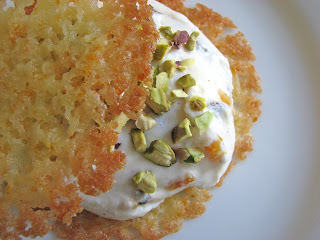 I do hope to convert you to my version of California cannoli, a kind of Franco-Italian whim. This recipe is actually quite simple to execute. However, it does require some advance preparation of three separate components, including candied orange peel. But once all the pre-preparation is done, they come together very quickly. I would suggest making the orange peel on one day and preparing the cookie batter and the filling on another day. Then bake the cookies and assemble on cannoli party day. - Candied orange peel will keep indefinitely in your refrigerator if stored in a clean airtight container. It can be used in your favorite cookie dough, stirred into vanilla ice cream, added to hot oatmeal, as a dessert garnish, dipped in chocolate or as a small treat with tea. Use your imagination. - The thin cookies are fragile so handle carefully. They will hold up in an airtight container for a day or so. 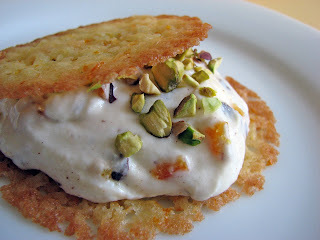 - It’s important to drain the ricotta to prevent the filling mixture from being too thin. Cheesecloth works best, but if you can’t find any, just use a fine mesh strainer set over a bowl. Draining the ricotta takes a couple of hours, so plan ahead. You can also drain it overnight in your refrigerator. Cut oranges in quarters and peel away fruit for another use. Place the peel in a pot and add water to cover. Bring to a boil and simmer until the white pith takes on a transparency. Turn off the heat and let sit for a half hour. Drain and with a sharp thin knife, cut away the white pith. Combine sugar, water and corn syrup and bring to a simmer to dissolve. Add peel and cook slowly over low heat until the peel is tender and translucent. Turn up the heat and cook until the syrup registers 230 degrees on a candy thermometer. Remove from the heat and cool. Store the orange peel in a clean airtight container with enough of the syrup to cover all the pieces. To use, drain a slice of orange peel and pat with a paper towel, removing as much syrup as possible. Chop and add to your recipe or slice and roll in sugar for a garnish. Melt butter. Remove from heat and stir in Grand Marnier, orange zest, sugar and salt. Add flour and mix thoroughly. Let sit at room temperature for one hour. 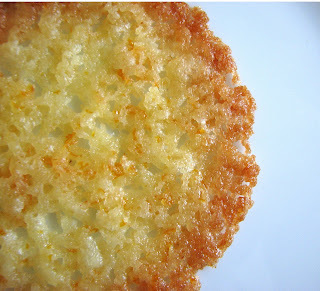 Drop 1 heaping teaspoon of batter on a silpat or parchment paper, 6 cookies to a sheet pan. Bake @ 350 degrees for 6 to 8 minutes. Let cool. Remove carefully with a small offset spatula. Drain ricotta in a cheesecloth lined strainer for 2 – 3 hours or overnight in the refrigerator. Beat the cream cheese to soften. Add powdered sugar and beat until light and fluffy. Blend in drained ricotta until the mixture is smooth and creamy. Fold in vanilla, cinnamon, chocolate, Grand Marnier, and orange peel. Chill. To assemble, place a dollop of the filling on top of a cookie. Garnish with chopped pistachio. Top with another cookie, if desired. Serve immediately. I like the idea of a de-constructed cannoli but I have three why questions. Why the cornsyrup in the candying of the orange? Why so much orange liqueur when the taste of candied orange is so strong? I have an inordinate amount of candied citrus in my kitchen right now. thank you for reminding people that it keeps forever-- it's great in so many things sweet and savoury! Hi Shuna - thanks for stopping by with these great questions. I'd lost the URL of your fabulous blog and am so happy to find it again. The corn syrup thing does bother me. To be honest, it's the way I learned to do candied citrus in pastry school. I also notice it's in David's recipe in Room for Dessert. It's there to help inhibit crystallization and serve as a softening agent, but now that we know what we know about corn syrup, it does warrant closer inspection. And when I look at my notes, I hurriedly doubled the liquid but didn't need to double the corn syrup, so I'll correct the 1/4 C to 2 T and add an optional qualifier. I do store the final product in the syrup rather than tossed in sugar. I wanted a bit of tang in the filling and intended to try chevre, but half of the guests objected so they got cream cheese. I didn't find the orange flavor too strong, but see that the T is a typo and should be 3 teaspoons or 1 T. Thank you! Thanks so much for your input. I hear great things about your new menus and will be by to join in the fun. If you come into the restaurant will you be sure to ask for me or email me a few days before so I can write down when you come in? I have never used an invert sugar for candying. although I rarely use a 1:1 ratio because I usually have it on the stove for far too long to have that ratio continue to work. My experience is that if you want to store candied peel in its syrup-- lid it and put it away hot and that extra condensation will keep the syrup from re-crystallizing. Just a thought. One day I am going to do a post on cream cheese alone. It really is the weirdest "dairy"! Shuna, thanks so much for the lovely invitation. And I'll be sure to try your tip on capping the syrup. Dear anonymous, whoever you are, I love your contributions. You completely inspire me! Thank you for your visits. i like the name of your dessert - i dig new wave anything :). chic blog too! keep on making yummy desserts! love the pics.